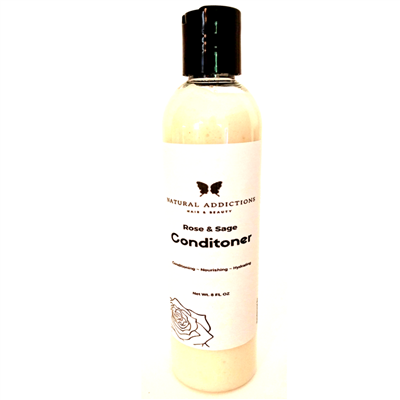 Our Rose & Sage Conditioner gently smoothes and nourishes you hair strands. This luxurious formula was created to condition your hair while intoxicating you with the relaxing & invigorating essences of roses & sage leaving your luscious strands soft and smooth. Rose extracts & essences hydrates and nourishes, while fortifying and protecting hair. Strengthens hair while nurturing healthy hair growth. Marshmallow extracts enable easy de-tangling. Rose water heals the itchy and flaky areas of your scalp. Moreover, it helps increase blood flow to the hair follicles, promoting hair growth. Rose oil is noted for its hydrating and emollient properties which help moisturize hair and fight any dryness or dehydration. Helps soothe irritated scalp & stabilize hair pH balance and aid in repairing porosity damage. Sage is beneficial in controlling damage and hair loss due to it being rich in nutrients such as vitamins B, A and C and the minerals potassium and calcium.